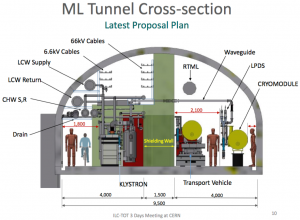 The question how great the (ILC tunnel’s) Great Wall needs to be was answered for the Kamaboko tunnel design at the Kitakami site by the final decision of the Change Management Board to a Change Request (ILC-CR-0012) for the 25-kilometre linear-accelerator (linac) sections of the ILC. The shield wall in the ‘Kamaboko’ shape tunnel , which gets its name from the loaf-shaped Japanese fishcakes, divides the tunnel into three parts: the beam tunnel with the accelerating cavities and the high power beam, the concrete shield wall itself and the service tunnel. In the original plans for the Kitakami site the shield wall had a thickness of 3.5 metres which would have been nearly as wide as the beam tunnel with 3.8 metres and the service tunnel with 3.7 metres. Now the shield wall size was reduced to 1.5 metres, which also reduced the tunnel width from 11 to 9.5 metres. “This decision means we are one step closer to a final design,” explains Ewan Paterson, who chaired the study. This gives the civil engineering and related design efforts a better basis for development of a realistic design of the interior of the linac tunnels and their contents. Over the past years many different approaches and ideas for the tunnel design have been pursued. In the original Reference Design Report (RDR) a twin tunnel option was proposed because it offered the most flexible solution independent of the site specifics which were unknown at that point in time. Even though this twin tunnel was the baseline in the RDR, further development for a single tunnel design was done. Especially for the radiofrequency distribution system both options were considered. In 2011 the Kamaboko tunnel design was proposed for the mountain site in Kitakami because it offered many promising options for a final design. With a thick 3.5-metre shield wall down the middle of the tunnel a sufficient shielding to emulate twin independent tunnels was possible. Of course further design and development effort was needed on this proposal to adapt it to the needs and requirements of the ILC. But was it really necessary to have such a thick shield wall? Finally, during the LCWS Workshop 2015 in Whistler, Canada, a full session was dedicated to the ‘tunnel question’: How thick does this ‘great wall’ have to be? In various presentations the progress of the R&D process was shown. “We had four different presentations by Nicolay Solyak, Tomoyuki Sanami, Vic Kuchler and myself on different issues related to thinning the wall,” explains Paterson “All of them showed different aspects of the impact in changing the size of the wall.” These presentations were followed by an open discussion on issues such as radiation safety and emergency egress passages. These discussions included many interesting aspects, like whether it would be cost-effective to have a wall with variable thickness depending on the radiation levels from dark current along the linac – an example being the quadrupoles. “The radiation would be highest around these quadrupoles, but it would also create problems during upgrades for the linac when parts would be exchanged and possibly moved,” explains Paterson. Upgrade capabilities are important for a machine like the ILC, therefore such a variable thickness wall would be too limiting in case of exchange of larger parts in the linac. After the workshop Ewan Paterson and his team summarised the presentations, proposals and discussions into a formal Change Request on the 25-kilometre wall and ‘linac only’ tunnel cross-section. There was consensus at the workshop that the 5-kilometre central region including the interaction point will be treated independently after further assessment of its options and requirements. Within the Change Request not only a change of the shielding wall size but also a number of other parameters were adjusted to fit the new conditions. One important factor were the conditions for access to the service tunnel and the equipment. In the original plans of the TDR no access restrictions for the service tunnel were included as the thick shield wall would protect personnel from any high radiation conditions. For the new design, the Kamaboko tunnel with 1.5-metre-thick shielding wall, the access will be limited to times when the particle beam is switched off while other systems can stay switched on. This ‘power on’ scenario includes for example the radiofrequency for the cavities and the high voltage for the magnets while the thinner wall can shield personnel from the radiation produced by dark current from the powered cavities in the beam tunnel. Additionally, due to developments in radiofrequency systems, the average failure rate for these stations is expected to be lower than assumed in the TDR. Therefore the regular downtimes of the machine would not be affected as strongly as presumed by the limited access. Hence, as assumed in the TDR, one scheduled 24-hour long maintenance day every two weeks can remain as planned. In January the Technical Board appointed a three-man review panel consisting of ILC Director Mike Harrison as chair as well as John Osborne from CERN and Chris Adolphsen from SLAC to review the Change Request and its impact on the machine. The review panel not only analysed the submitted materials and changes but also opened the discussion with the requesters concerning possible worst scenarios for high local radiation produced from dark currents. “We discussed many different scenarios and possible sources of radiation from dark currents like magnetic fields of quadrupoles and dipoles,” explains Paterson. “We even considered the fact that the linac is not straight but follows the earth’s curvature. This is not insignificant over long distances.” In a kilometer the linac’s centerline has curved by half of the accelerator aperture which means that the particles are not moving in an absolute straight line but along the earth’s curvature. “As part of our review process we made a number of simulations for the different scenarios of the tunnel cross-section,” explains Mike Harrison. 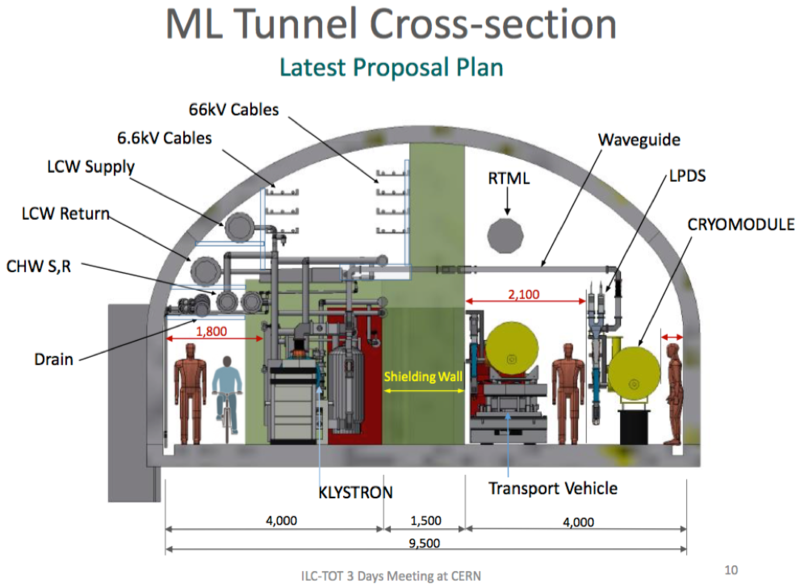 “These studies led us to the special conditions that we also want to implement active radiation safety for the tunnel instead of solely relying on the passive protection of the wall.” The impact of the more limited access to equipment in the service tunnel than the free access assumed in the TDR was also considered and discussed between the review panel and Paterson’s team. “After this Change Request we have not only settled some important parameters for a cost of the tunnel construction by approximately 11 billion Japanese Yen ,” adds Paterson. “82% of this cost reduction comes from thinning the shield wall.” Additionally to this cost reduction the construction time would also be 5 months shorter! “All factors showed that it was beneficial for the project to reduce the shield wall size and install other measures instead,” explains Harrison. “Therefore the panel recommended approval to this request during the ECFA Workshop in Spain.” The change was in fact approved and the change request will pass into the design baseline. This was a huge and important step for the ILC design. This should be an important step also for my ILC artworks! Thank you for the cross-section diagram.